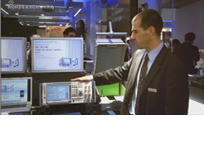 Rohde & Schwarz presented the first single box test platform for WLAN offloading, as well as for in-device coexistence tests at the GSMA Mobile World Congress 2013 in Barcelona. Equipped with the LTE CallBox and WLAN signaling option, enables simultaneous LTE end-to-end and WLAN measurements on mobile devices. The R&S®CMW500 wideband radio communication tester supports all major cellular standards, such as LTE, WCDMA, EV-DO, and non-cellular standards, such as WLAN/Wi-Fi, in one box.